Now, since he was such a good patron and specifically put in $40 for this sketch, I decided I wanted to make it nicer than just a loose sketchy piece. Also, since there isn't really any costume or theme to it, I figured I'd do a sort of portrait piece, only making him into a panda. I gave him the comic to read because the event was comic book orientated. This drawing took a little over an hour, actually. My lunch time and a good chunk of the afternoon break. But, like I said, I was going for a nice little drawing in my furry art style rather than a sketch. One other note, more of a personal observation... While the event itself was a big grand slam for CLAW and I had a good time and did several drawings with varying degrees of success, I've come to realize that I'm still going WAY TOO SLOW! After all the practice on my blog, when it came to an actual event, I reverted to my comfort zone in speed and style. So I'm not entirely happy with the results. I should say that I probably did better than I would have BEFORE starting this blog, but there is still a long way to go to reach the results I'm looking for! 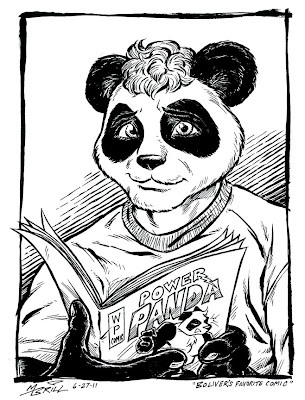 Anyway, I hope our patron saint likes the drawing I did of his Panda character, and that it, in some small way expresses my appreciation for his generous support on Saturday!